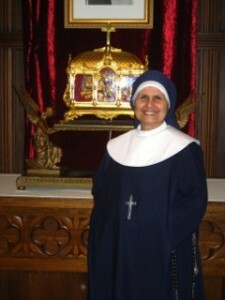 This month I have the honor of sharing with you my interview with Sr. Georgette Andrade, SSC. Sr. Georgette and I have known each other for a few years now and we attend the same church. She is one of the sweetest people I have ever met and it is a privilege to know her. 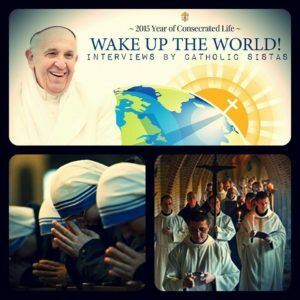 I hope you enjoy her story here as part of our interview series for the Year of Consecrated Life. What is the name of your order and what is your order’s particular charism? The name of my community is The Servants of the Sacred Cross. We pray daily for all our priests and for orthodoxy and unity of the Universal Church. How did you know God was calling you to this life? When I moved to Lexington, KY from Florence, KY in 2001 the last thing on my mind was serving God as a Sister. I was born and raised Catholic, but over time fell away from the Church and lived my life to please myself. I’ve had 3 failed marriages and in the 1980’s I had 2 abortions. The abortions I kept hidden away and told no one about. Even after moving to Lexington, my life was very far away from God, but I have always leaned on and trusted in Our Blessed Mother. It was Mary whom I gave my aborted children to because I knew she wouldn’t abandon them as I did. I believe that she put the thought of coming back to the Church in my head and I even sought out a Mass or 2 to attend, but it wasn’t until I moved to my 3rd apartment in the Chevy Chase area that I realized the Cathedral of Christ the King was in the middle the entire time. I started attending daily Mass, but not receiving Jesus, and also joined Catholic Way Bible Study where my eyes were opened to scripture and the beauty of Mass for the first time. There was a longing in my heart to receive the Eucharist so I made an appointment with Fr. Hank Kenney, God rest his soul, and confessed myself. I had no idea until that moment how very dark my life had been and the burden I was carrying around. Not long after my confession I began to sense a need to serve God in a deeper way. My thoughts were constantly of Him and I could feel a change taking place in my heart. Over time He began the outward transformation too. My way of dressing became very modest and make-up and hair color was no longer important to me. The transformation, both inside and out, was a process and took about 7 years. The last thing I needed to do before I could totally belong to Him was to surrender the secret of my abortions. Our Lady of Guadalupe gave me the courage to push past the fear and lies and seek healing through a Rachel’s Vineyard Retreat. Sometimes I’m still amazed when I look back to where my life was in 2001 and where I am today. God’s Mercy has no limits! When I tried to find a religious order that would accept older women I hit quite a few brick walls and it was quite frustrating until one Sunday morning at Mass I saw a beautiful Sister in a blue habit and veil. That was Sr. Julia of the Servants of the Sacred Cross, who just happened to be passing through Lexington. Tell us a bit about what your day-to-day life is like. My day starts at 3am with coffee and prayer which consists of the rosary and chaplet. After that I pray my morning devotionals and Divine Office until 6am. I start getting ready for work at that time and my goal is to be out of my apartment by 6:50. My apartment is located across the street from the Cathedral of Christ the King, so it’s a very short walk. I start my work day in our St. Kevin Perpetual Adoration Chapel to spend an hour with Our Lord and then Mass at 8am. After Mass I walk through the church and down the hallway to the office to start my job as secretary of the cathedral. I have a full time job at the cathedral and it’s hardly ever dull or boring! Something is always going on to keep me on my toes. Most days I will walk home for lunch, but my co-workers and I try to have lunch together at least once a week. SSC is also a habited community and although not mandatory unless we are attending Mass or performing ministry work, I am very fortunate to be in a church environment where I can wear my formal habit everyday including days that I’m not working. It serves as a visible sign to the world of my Catholic faith and I have met with only positive reactions when out in public. My work day ends at 5pm. My apartment is my sanctuary and I enjoy the quiet evenings. My evenings aren’t structured like my mornings, so it’s more relaxed with Evening Prayer and some reading or a movie on Netflix which I watch on my laptop. I turn in fairly early and keep the same schedule on the weekend with a slight adjustment for Sunday when Mass is at 7:30 am. What advice would you give to someone considering a consecrated religious life? Take advantage of all the Come and See weekends that many communities offer. Since my vocation came later in life, I didn’t have this opportunity to spend time with Sisters in a convent and test the waters, so to speak. Spend as much time as possible in Adoration if there’s a chapel in your church or even with the Hidden Jesus in the Tabernacle if there isn’t a chapel. Jesus is present in both places. Immerse yourself in the Mystery of the Mass as often as possible outside of the Sunday Liturgy. Our priests are wonderful examples of what it means to totally give of oneself in service to others through Christ and they are a fountain of wisdom and knowledge. If there is a Sister in your parish seek her out and have a chat. Most of all pray to know God’s Will for you. What does it mean to you that Pope Francis has dedicated this year (Nov. 30, 2014-February 2, 2016) as a Year of Consecrated Life? God Bless Pope Francis! What a wonderful way to honor the women who are giving their all for the Beloved and lifting up the needs of the world through their prayers and service. Consecrated Life is a special gift from God and although there are many expressions, I am particularly grateful for all the nuns in cloister around the world who dedicate their lives in perpetual prayer for the rest of us. To me they embody true feminine beauty and strength. What is your favorite thing to do during your down time/recreation time? As I mentioned earlier, I like to watch movies on Netflix. There are some wonderful selections in the Faith and Spirituality section and I also like to watch the Asian epic films with a little bit of history and fiction mixed together. The costumes are fabulous and I do have to read sub-titles, but it’s worth it because the movies are well made. I also have a game on the computer that I like to play because it’s a way to decompress from the day’s activities at work. It’s called Staries and the object is to line up at least 3 stars of the same color and delete them. The colors are always changing and beginning on level 3 the stars will lock which means you can’t move that row. I have made it to level 9 only once! Another thing I like to do, especially on Sunday afternoon, is turn on some instrumental praise music while reading or just being quiet. Kerri Baunach is a Catholic wife and mother of three boys (plus three in heaven). She and her family live in beautiful central Kentucky where she is active in her church, a member of Cursillo, and a Benedictine Oblate. Kerri often writes on her Catholic faith, pregnancy loss, her kids, and pro-life issues. Kerri is a former music librarian (16 years) now stay-at-home mom, was a musician for over 20 years, loves taking her kids to the library (and loves that they love it), is passionately pro-life, can’t cook, and has lived in six states. In additional to writing at Catholic Sistas you can also find Kerri on her own blog at Journal of a Nobody. Most certainly are one of His most precious daughters. Giving light to the hidden. Only with light can one heal and share His light. You are an example of a very bright light of love and mercy from our Heavenly Father. We are blessed dear sister to have you in community of The Servant of the Sacred Cross.